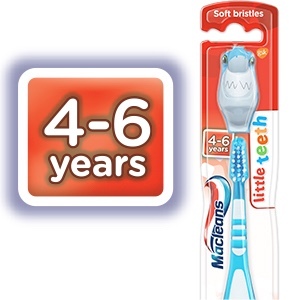 Macleans Milk Teeth Kids Toothpaste and Toothbrush help children's teeth grow up strong. 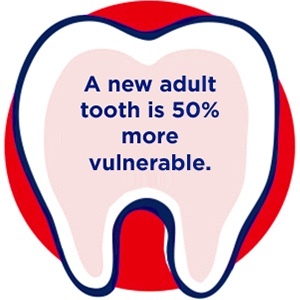 Baby teeth are cute but they are also vulnerable, so as your child's first little tooth pops through, let the brushing begin, because good tooth-brushing habits can’t happen soon enough. 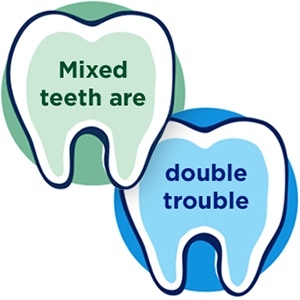 Like grown-up teeth, baby teeth need to be brushed at least twice a day to keep them strong and healthy. 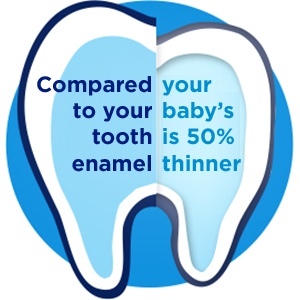 However the enamel in baby teeth is 50% thinner than that of grown-ups and more susceptible to attack. As your child gets older, their diet may change to include more sugars from food, drinks and sweets that are then converted by plaque into acid, one of the key causes of cavities. 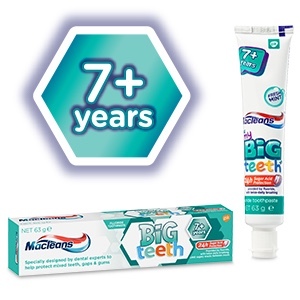 Macleans Milk Teeth Kids Toothpaste provides special care through Sugar Acid Protection* to strengthen and actively defend Milk Teeth against cavity-causing sugars. They've also got a child friendly taste. 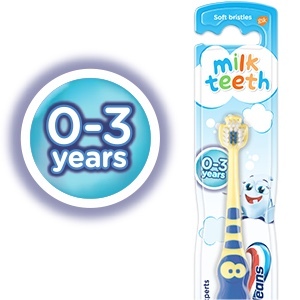 Macleans Milk Teeth Kids toothpaste is designed by dental experts and suitable for children 0-3 years. The three-striped triple protection formula provides cavity protection for your child's teeth to help ensure their adult teeth come through healthy and strong. *Limit sugary snacks between meals. Protection provided by fluoride with twice daily brushing. 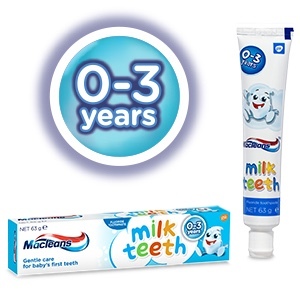 Macleans Milk Teeth Fluoride Toothpaste provides protection for your growing child's teeth. - Specially designed by dental experts for your growing child’s teeth. - Gently cleans with brushing. - Suitable for children 0-3 years. Glycerin, water, hydrated sillica, Xylitol, PEG-6, Xanthan Gum, sodium fluoride, sodium methyl cocoyl taurate, disodium phosphate, Flavour, Titanium Dioxide, sodium saccharin, methylparaben, propylparaben, CI73360, CI74160. No Macleans toothpaste contains sugar. Contains: Sodium fluoride 0.111% w/w (500 ppm fluoride). Do not Swallow. Always follow the label. Brush twice daily and not more than three times. 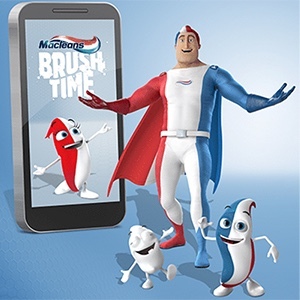 Use a pea-sized amount under supervised brushing and be sure to spit out. If irritation occurs discontinue use. 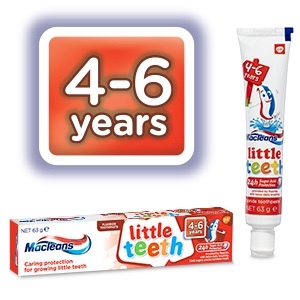 Macleans Milk Teeth Kids Toothpaste 0-3 Years 63g is rated 4.5 out of 5 by 10. Rated 5 out of 5 by Ceebee88 from Growing teeth milky white My kids love this toothpaste it is the only one they will use. No string minty tart for my little ones who now love brushing with milky white ! 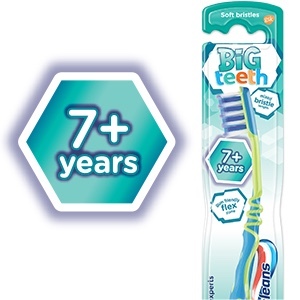 Rated 5 out of 5 by hails7 from Great product My daughter loves the taste and loves brushing her teeth now.